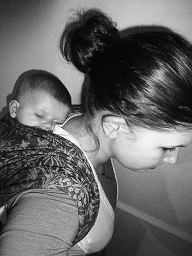 The more I work in this very specialised little area of child care, the more I realise that the majority of people I come across, prior to meeting me or coming to the library, have very little idea of what I do or what a sling library is actually for – what possible value could something like this have? At the end of each librarying day I sit amongst the heaps of discarded carriers having my first cup of tea for several hours and think of all the people who have been in and out that day, how each have seen a tiny portion of the library’s work – perhaps enough to realise its value – for them, for everyone – or perhaps not. So here is a full day, an insight into my life and work – a chance to think about the people and situations the sling library serves. In the morning, I rise with my own two children, and I’m sure the scene before the school run is exactly the same as in countless houses across the world – one child is moaning about getting dressed and searching for reading records and PE kit, the baby is smearing marmalade in her hair and doing death dives out of her highchair, and I am putting on tights with one hand and brushing my hair with the other – in the kitchen. 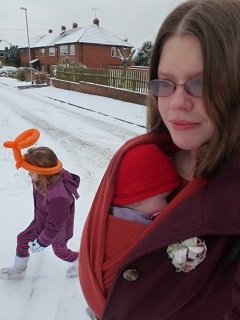 It’s just before we leave the house the picture changes a little, as the baby is wiped down and secured into one of the day’s selection of carriers as we work our way up the street to school. On return, it becomes clear that this isn’t exactly a normal house on a normal day. I give the baby a kiss and settle her with someone else, as it is near impossible for me to run services at this level and care for her at the same time. The dining table is moved to one side, and there is sweeping, wiping and mopping before the boxes, suitcases and bags are carried through and the carriers are arranged in various ways around the kitchen and dining room. A full length mirror is pulled out of the understairs cupboard. Several weighted dolls rise from the trunk in the kitchen. The dining room dresser, instead of holding plates and glasses, is emptied of carrier instruction manuals, accessories, forms and handouts. The printer is set to churn out rental forms, welcome packs, rental pack, TICKS guidelines, healthy hips handouts, positioning posters, discount slips. Library information displays replace the birthday cards on the shelves, the childrens’ toys are brought out for them to share with the public, and last but not least the gate is propped open and the sign displayed -The West Yorkshire Sling Library is open. Within minutes of opening, our first visitor arrives, followed by two or three more. Straight away we have one of our returning customers who finds her carrier invaluable for her toddler, something to have in the handbag ready for when little legs are tired or not going fast enough in the right direction. She is a happy long-term renter and does a swap, returning her Toddler Connecta and having a go with the Tula Toddler. We go through a back carry demonstration, and she takes it away in its box, saying it’s like having an early Christmas present. Our second visitor is returning a Didymos woven wrap, and asks about options for back carrying her small baby with the woven wrap she has now bought, so she can do things with her older toddler without a baby on her front. I suggested that carrying on the hip could work just as well for this, and that was a welcome idea, so I passed on videos of several types of carry for her to access at home. Our third visitor has been trialling a Beco Gemini with her 9 week old baby and is happy with the support it offers out on walks and getting out and about, but wanted to make use of our free swap service to try something a little softer to give her her hands back at home. Together we tried on the Hop-tye and the Angelpack with the demonstration doll, then she tried the Angelpack with her baby using the mirror, and was happy with the fit, so did a straight swap. The door goes again and the fourth visitor is someone who has not visited before, but has had advice on the phone. Her lovely 2 year old suffers from health conditions meaning she is not yet able to walk, she naturally finds this very frustrating and her preference when she is upset is to be carried by an adult – taking a Toddler Connecta and a Storchenwiege Ring Sling away allows her parents to carry her comfortably with respect to her medical needs, and she can be comforted and included with all goings on at the same time. A few people arrive at once and we quickly assess their needs in turn. The fifth has a Hop-Tye which she is finding too small for her 8 month old. I do a quick demonstration to show how to make the most of its panel size and she is able to make it grow to fit. Her one problem then is that she now cannot justify buying something new! The sixth has another Hop-Tye, a library one this time, and is worried it takes too long to put on with her wriggly 20 month old, who wants to be up and down a lot when walking outside, but she’s not happy about the idea of pushing an empty pushchair and chasing him at the same time. She shows me the process she’s been going through and her little boy shouts ‘No! Down! No! Down! so we abandon the idea. I fit her with a Scootababy hip carrier, and in a few minutes she is able to give him a quick carry on the hip which turns into a quick sling on the hip without him really noticing. The seventh has a 17 week old who is fully in the grip of NOSY baby syndrome and only wants to be carried off to the side with her head inclined so she can see everything that is going on, her parents arms are very tired! I look at how the baby is being carried in arms and we swap the Bondolino that she had been crying in for a Storchenwiege Ring Sling and demonstrate three positions with this. On the very first go, the crying, fighting the carrier babe relaxed and looked about, and the mother told me it was the first time she’d been happy in days. In the meantime, the toddler has been going in and out of the Scootababy for practice behind me, and I turn to find him in a wonderful position, everyone looking really comfortable. ‘Do you want to get down?’ he is asked by his Mum. ‘No! He says in reply. She starts planning a day out that would be difficult with a pushchair. We write up some forms, and three more visitors join us. The baby in the ring sling has now fallen asleep. 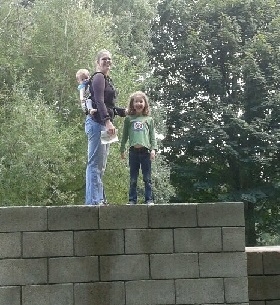 Our eighth visitor of the day is returning a Boba 3G she has been using with her 8 month old. She tells me how everything now takes so much less time, because she can just put him in it and get things done without him wreaking havoc in her wake. She wonders how she ever managed before – she has used the library codes and bought her own. Another returnee, our ninth visitor brings back her long term loan of a Beco Gemini and parts with it reluctantly – although she is another who has her own carrier now waiting for her at home. Number ten is a couple who have not been along before visiting with their 3 week old baby. They self-confessedly say they have no idea at all about what is out there, but they need something, as the little one is having feeding problems, is colicky and not settling. I demonstrate a stretchy wrap, a Close Caboo, a Bondolino and a Beco Gemini – one parent is very put off by the idea of the wrap, but both parents try the Bondolino with the doll and then with their newborn. As they walk around carefully cradling the baby in the carrier they suddenly drop their hands, then swing their arms, then smile – the sensation of carrying your baby close, but having your hands free, for the very first time. They decide to rent the Bondolino and we do some paperwork. Visitors eleven and twelve arrive together. 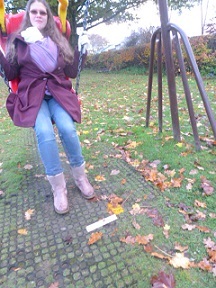 One has been using the library’s Tricot Slen to help her get out and about with her baby and toddler. She got in touch with us as she could not use her front pack carrier with her baby born at 5lb, who is now 9 weeks and just hitting the 8lb lower weight limit for its use. The other had been using a library Moby with her 9 week old, now 16lb in weight at the other end of the spectrum. Each wanted to try the next stage up before committing to buy so I demonstrated a woven wrap, two small bodied soft structured carriers in the Beco Gemini and the Rose and Rebellion, then the Napsack, Himmel and Babyhawk mei tais by request. After trying on sessions with dolls and babies our littley took home the Beco Gemini, and our big lad went with a Napsack. Our thirteenth visitor of the day pops her head in to return the Caboo DX, she was another facing the lower weight limit problem with her front pack, and she is happy that her baby is now big enough to fit in her baby bjorn. The fourteenth is our youngest visitor of the day at 10 days old, his mother came along to a library session when pregnant and came back with her new baby to borrow a stretchy wrap. We refreshed her knowledge with a doll demonstration and a rundown of safety checks, then she took her stretchy away already tied on as they were on their way out for the day to ease their oldest’s cabin fever. Coming in the side door now is a returning library user who has an older child that needs to use a wheelchair, so she uses her carrier to allow her to take both of her children out at the same time. She has a selection of her own but wanted to rent something pretty for the festivities. Our fifteenth visitor of the day chose a bright red Hoppediz Paris ring sling for use over Christmas, and left quickly. A challenge for us now, a new visitor who is looking at options for an epic trip around Europe next year with her toddler – now 13 months old – who has never been carried before. She expressed a preference for buckles and we looked at sturdy options such as the Tula, Ergo and Manduca as well as travel-light ideas such as the Connecta Toddler Solarweave and the Boba Air. Undecided, she took both the Ergo Performance and Connecta Toddler models away for a good road test. Our seventeeth is returning to renew her carrier over the festive period as she is planning an exciting Disneyland Christmas with her 8 month old and 4 year old. Whilst here, her mother asks me if we’ve anything she could use to carry the older child on the trip, as he is in an ‘I want to be carried!’ phase and her arms are tired! So they go home with an additional big kid carrier in our preschool size mei tai, it’s nice to see grandparents involved in carrying. The library is pretty full now and visitors 18,19 and 20 are waiting to see me. One Boba 3G is returned and she has made up her mind to buy, we discuss discount codes and the features of the new 4G in comparison. 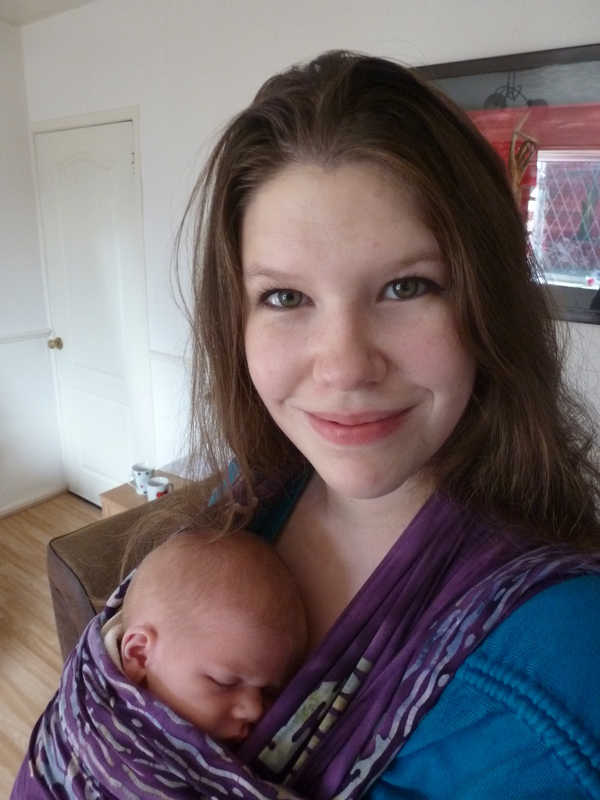 One Moby wrap is returned, charged with being too cosy and allowing her 5 week old to sleep a lot during the day, something she was trying to discourage – a buckle carrier was decided on as a better prospect and a swap was made. And the last in line was mother who had already bought a stretchy and a Connecta, but was struggling with both and her new baby – a demonstration of each, and a tutorial with the doll, as well as going through the safety checklists and paperwork – and she felt much happier with her purchases. Visitor 21 is a family of three including a 4 month old baby who are going to visit family over Christmas on a plane and cannot take a pushchair with them, they had not used anything before but felt happiest with the Connecta after a demonstration of a selection. They asked about using the carriers facing forward and we talked through that option, including a demonstration with the Beco Gemini, bu tin the end they preferred the Connecta for them and the new Natural Mamas wrap conversion Connecta is off to spend Christmas abroad. There’s only a few more to do, now, as number 22 asks how to get the most from her Tomy Freestyle which is hurting her back with an under-9lb baby, so we adjust it to its optimum and run through as many tips and tricks as we know to make it work for her. Having seen the other options, though, she decides to check out ebay and invest in something else. I give her details on buying new and secondhand, and offer support with any purchase she makes. Visitor 23 sticks her head round the door and waves a returned Manduca and Didymos at me, I nod gratefully and turn to our twenty-fourth attendee, who has been having problems with her baby’s position inside the Bondolino. Having troubleshooted the positioning, she elected to try something new and her 8 week old was soon snuggled up asleep in the Connecta. Discussing wearing options for that and running through safe positioning takes a further few minutes, and at the end of those I realise that the library has been open for nearly 5 hours,as it is approaching 3pm. Yet, three more visitors are coming along the path. The first has brought a pouch for me to troubleshoot, but it was a gift from a friend and as it is a sized to fit carrier, was unfortunately the wrong size. This visitor suffers limited mobility on one side and liked the idea of a one shouldered carrier for his 12 week old for this reason. We looked at the adjustment mechanism of a ring sling in comparison, then briefly experimented with buckle carriers done up on one side in advance. He was happy with the idea of both of these but chose to take the Hoppediz ring sling home, with access to my online resources, for further experimentation. Then talk turns to reflux babies and tongue tie, as a common theme in the room – visitors twenty-five have come on the advice of their health visitor to get something to keep their baby upright and moving, aiding the symptoms of reflux in many babies. Having been there myself, we experiment and they are happy with the idea of the babyhawk, so take that one home with them. The twenty-sixth visitor looks to be the last of the day, so I flip the kettle on and delegate the afternoon school run. Our final issue is to address the idea of carrying her 5 month old around winter clothing, so we discuss options for comfort and adjustability including demonstrating several kinds of carrying coats and accessories. In the end, the type of carrier was adjusted, swapping something with a lot of fabric – the JPMBB stretchy wrap – for something with much less – the JPMBB ring sling. Just as I wave goodbye and hit the kettle, we have one final visitor who I sit with until past 4.30pm. She is having feeding problems with her 5 week old and struggling with back pain from feeding, winding and carrying the baby in all kinds of positions, getting stuck under sleeping little one and not daring to move. She asks about the possibility of feeding in a sling, and we go through options and precautions for that. We spend a good chunk of time talking about positioning, infant reflexes, instinctive posture and baby feeding patterns. When we have done with our cup of tea she decides to take home a Hana stretchy wrap to give her her hands back, and she also takes the phone numbers for the local breastfeeding support resources, a copy of a breastfeeding guide and a copy of the Wonder Weeks to help her over the next month. 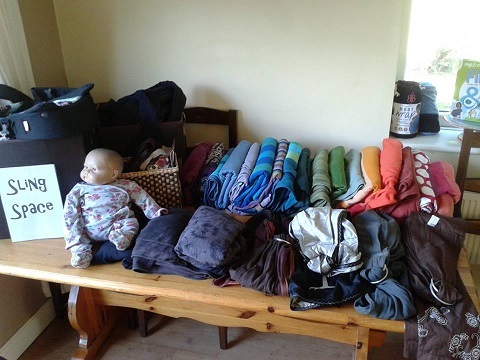 I wave goodbye, and look around at the devastation that is my dining room and kitchen, so get to work – he carriers get sorted into the wash pile and store piles then backed into their boxes and cases. The paperwork is sorted and filed, swaps noted and extensions marked. The emails for rental instructions will be done later, so they are put aside. The money and deposits are sorted out and the handouts and instructions filed away. Phone calls are returned and tea is started as my two have now burst onto the scene from their confinement to the living room with Daddy. After dinner and bedtime, I sponge clean some carriers and put them to dry, another few go into the machine. When I do get to the sofa, I update the library page, answer emails and Facebook messages, and send out the rental mail. 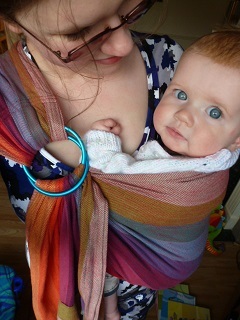 I am told that the toddler in the Scootababy had a lovely day out, and the baby in the ring sling is happy as larry. I’m sent a message of thanks from two more visitors, and one would like to donate her not used carriers to our library. Are you feeling tired yet? I am. Are you feeling happy yet? I am. With many thanks to all our library visitors. Many small details have been changed for the privacy of those involved. Back to basics – carrying on a budget.